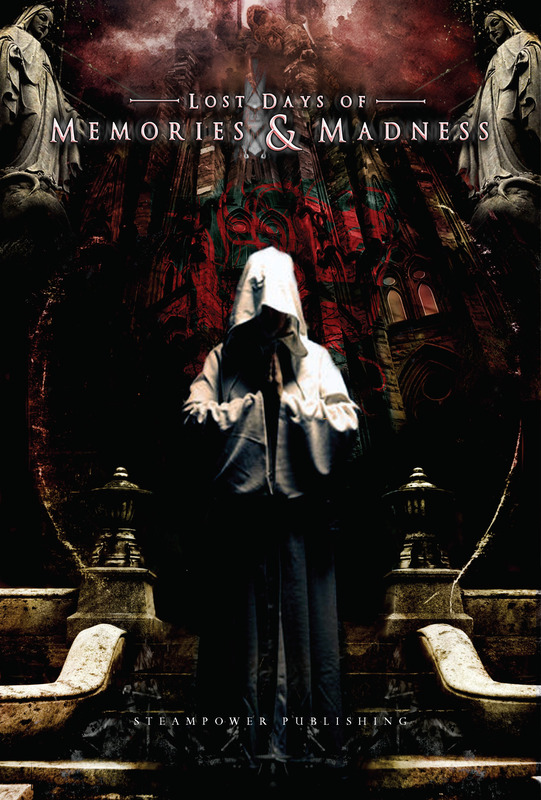 I got some copies of my latest game, Lost Days of Memories & Madness, to sell at Dragonmeet at the weekend and realised I’d barely posted about it here! So, with the game going on sale in the next week, I aim to put that straight! First up, here is a look at the awesome cover – the picture is by George Cotronis, whilst the design is Paul Bourne, and combined they make for a very striking piece of art. The interior art is all in the same vivid style, and Paul has used each of the pieces as chapter heads. I’ll post them up over the course of the week too. Setting is characters, the rest is just color. Figure out how to express what you want from the period through the people. That’s what Rob Donoghue posted over on twitter a while back in a discussion about historical settings and I’m kinda conflicted about it. I was trained as a historian, so I can see both sides – I appreciate how historical characters, traditionally kings but in recent times more common folk, are great at providing a lens through which we can examine an era. Conversely, I dig the historical events and setting themselves – the battles, as it were, or the colour as Rob puts it. To me, they’re more than just flavour, they are the setting. Yet it’s easy to get bogged down in the minutiae of a setting, providing the readers with tons of needless details in the hope that you’ll bring the setting alive, but in reality running the risk of burying any sense of flavour or interest they might have had.But of course it’s possible to go too far the other way, instead of providing a setting overview just providing a series of character descriptions and hoping readers can infer what they need to for the biographies. I think the right mix will vary from game to game – to me games like Polaris and Hot War get it right, providing enough setting to spark my own imagination, and enough characters to give me an idea what to do with that setting. The once-noble creatures known as dragons were perhaps the first victims of elven conquest, for these great reptiles were no less arrogant and independent than the elves themselves and neither race would bow to the other. As mighty as the dragons were individually, they were few number and overpowered by the armies of the elves. Those rare creatures that still live are as shadows of their former selves, broken and bound by elven magic to serve as steed or pet, their memories of past glories long since stolen by the elves. But it is whispered that, somewhere in the hidden corners of the world, true dragons still live. For the memories of such a beast – full of simmering rage long harboured – to be harvested would be a treasure highly prized indeed. The once-noble creatures known as dragons were perhaps the first victims of elven conquest, for these great reptiles were no less arrogant and independent than the elves themselves and neither race would bow to the other. Kesar is the last of his kind, saved from a life of slavery by the draconic magic that changed him from dragon to elf, allowing him to bide his time and plot his revenge from within the Eternal Court. That the elven memories that crowd his mind alongside his own threaten to drive him to madness is of no concern to Kesar – his thirst for revenge drove him insane long ago. Now, both pieces have their own advantages and disadvantages. For me, I think the former just edges it, giving me a glimpse at the world and allowing me to fill in the blanks myself. The second piece offers me the same glimpse, but I find a little too focused, a little too ‘zoomed-in.’ In focusing the lens through the eyes of a single character, there’s the danger of it just saying something about that character, not the setting he inhabits. Which do you prefer? Are you more a fan of ‘kings’ or ‘battles’ when it comes to background? And what settings have got that balance just right? Or should that read Old Games? Awesome artist and games designer Keith Senkowski uploaded some art I commissioned 4 or 5 years ago a couple of months back, along with the comment that it was for “a role-playing game that will never see the light of day.” I’ve got to admit, that stung a little, not least because, in my head at least, one day I still hoped that Six Bullets for Vengeance would still see the light of day. But how realistic is that hope? I’ve not touched the game in over a year, and even then that was just a bit of tidying up of the text. Six Bullets saw a fair amount of playtesting 18 months ago, when Rick Evans (aka Indie Pete) and the Pompey Crew ran the hell out of it, but this came crashing to a halt when fellow Collective Endeavour-ites Joe Prince and Gregor Hutton gave it a good beating and pointed out some of the fundamental flaws that I’d been too blind to. It went into the metaphorical draw, and hasn’t come out again since.